I was bored barely into a year working as a network engineer. I chanced upon an article by Dr Tan Chi Chiu about his Raleigh International expedition to Mongolia and responded to the call for selection. One muddy weekend and six months later, I was part of 93D Siberia. After I returned from Siberia, I volunteered with the locally organised Operasi Raleigh Batam in 1997. Later that year, while waiting for a doctor's appointment, the idea of doing something simple yet challenging for a good cause came to me. 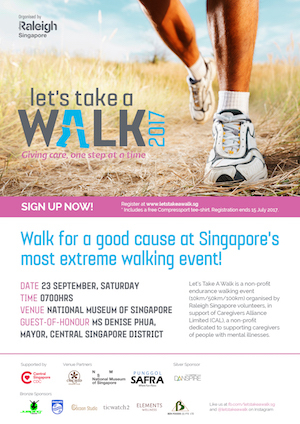 With a group of like-minded Raleigh folks, we started “Let's Take A Walk” (LTAW), with the aim to raise $36,000 by walking 36 hours, 100km around Singapore. While I missed some major action when I was away in the US to further my studies, I quickly caught up with Raleigh’s activities when I returned to Singapore. My love (for community and adventure) affair continued with Operation Mingalaba 1999, Operation Tashi Deleg 2001, Project Climb On 2002, and more LTAWs. Raleigh gave me a break when other adventure possibilities turned me down. Raleigh opened my eyes and heart to the many possibilities to learn and to give. Raleigh brought me to many of you, whom I am proud to have as friends and privileged to do meaningful things together. I'm inspired to do this so that we can continue our love affair together. I first volunteered with Raleigh's tsunami rehabilitation project in Nias, Indonesia in 2005, while still a college freshman. I continued helping out with the project and eventually joined the Executive Committee of Raleigh Society before leaving to further my studies in 2008. The last 10 years have been shaped by Raleigh in one way or other: doors of opportunity that have opened due to my time with Raleigh; my outlook on life and living; perspective on development and volunteerism; as well as the imparted wisdoms of Raleighians who came before me and whom I have had the honour and privilege of working with and calling them friends and mentors till this day. One can say that I "grew up" with Raleigh, and am now inspired to pay this forward by contributing back to the Society that has given me much, so that it continues to enable those who are just beginning or continuing on their journey to help others. My first expedition with Raleigh was Operation Vannakam 2009. I found it refreshing to meet like-minded people who love spending their holidays in tents up in the mountains. As an experiential educator, I enjoy the art of storytelling and am a firm believer that world peace can be achieved if people start turning to one another in good conversations. The camaraderie in Raleigh is what keeps me going and I’m thankful for the amazing people I’ve met, as they are my sources of inspiration. Margaret Mead once said: “Never underestimate the power of a small group of committed people to change the world. In fact, it is the only thing that ever has.” This is my wish for Raleigh: that we never to lose our legacy in instilling a sense of adventure in young people. When I first heard of Raleigh International in 1999, I was past the qualifying age of volunteering in a Raleigh International expedition. Nevertheless, I signed up for the first challenge of enduring the Selection Weekend and convincing the selection team why a not so “youthful” person like me should be chosen. In less than a year, I was off to Chile, trekking in the Southern Patagonia, building trekking paths at Tamango Reserve and constructing a fire station for a small village that was devastated by fire a year ago. I personally benefitted from the expedition and also witnessed the developmental effect that the projects had on some youth-at-risks. I will never forget how one of them (who earlier told me stories of how he stole cars and got caught) defied instructions to sneak out to work at the construction site at night to ensure that the project could be completed on time. He was beaming in pride when we celebrated the completion of the project with the locals at the end of the Expedition. Upon return, I organised the 2001 Selection Weekend and helped out on ad hoc basis on some of the projects that came along the way. A friend recently reminded me that it was perhaps high time I paid back to the organisation from which I benefitted so much. Hence my decision to be involved again. I am now inspired to embark on this journey to continue the legacy of Raleigh and do something good for the society. My first encounter with Raleigh was as a volunteer in the 2001 Operation Tashi Deleg expedition to Song Duo village, in Tibet. The next year, I participated in Project Climb On, which paired up youths from ITE with younger boys from the Boys Town to learn rock climbing. In 2005, I volunteered with local project Rakan Raleigh, a mentoring project with Jamiyah Children’s Home between April and October. The 15 of us were paired with 30 teens from Jamiyah and we mentored them through a series of adventure-based activities, such as dragon boating, adventure treasure hunt, rock climbing, obstacles courses and an outdoor camp. In 2008, I helmed the LTAW organising committee. That year, we attracted 907 walkers who helped to raise $55,000 for the Movement for the Intellectually Disabled of Singapore (MINDS) and for Raleigh Society’s upcoming expedition Operation Vannakam 2009. When I volunteer or help without motive or money, I feel happy and fulfilled. It’s a different kind of joy that one gets from achievement at work. Happy and fulfilled, that’s what volunteering is to me. It all began at Operation Tashi Deleg 2001 where the seed of adventure and volunteerism was planted in my heart. From there, I volunteered with more Raleigh projects such as Rakan Raleigh, Operation Vannakam and Project Reli(e)ve, which commemorated Raleigh’s 10th anniversary as a society in Singapore. In 2013, I organised Let’s Take A Walk with proceeds donated to the Melrose Home – Children’s Aid Society, and Raleigh Society. Fourteen years have passed since 2001, I am very fortunate to still have the opportunity to serve and know many like- minded sincere and positive Raleighians. I am proud to be a Raleighian and hope the fire of adventure and volunteerism continues to burn bright. I was an unathletic 18-year-old when I heard my then PE teacher Naomi Tan recount her exciting Raleigh International expedition. Curious, I researched Raleigh and became really fired up about the 3-month expedition to a foreign land (think snow holes people!). I set my mind to “change” my lifestyle and became very active in sports during my four years in varsity. Once I graduated, I signed up for a Selection Weekend – made up of 48-hours of no sleep and all kinds of physical and mental torture – that till now sends shivers down my back. Unforgettable was the casevac through a muddy mangrove swamp (did you know there’s a special technique to prevent sinking in?). Late 1998, I was off to Chile 98H where I built snow holes and helped to create a sliver of a national park trail. The experience of sleeping next to crashing glaciers, while howling winds threatened to rip my one-man tent and me off a cliff, will stay with me forever. Upon return, I helped to organise Operation Mingalaba in 1999 and Operation Tashi Deleg in 2001. I was also involved in Project Climb On 2002, before dropping off to do international voluntary work. In 2007, after the birth of my son, I decided to get back in touch with my Raleigh mates and began helping out on an ad hoc basis. Now that my son is older, I have decided to get involved again with Raleigh. Hopefully, we can do something good with the 2 years we have!